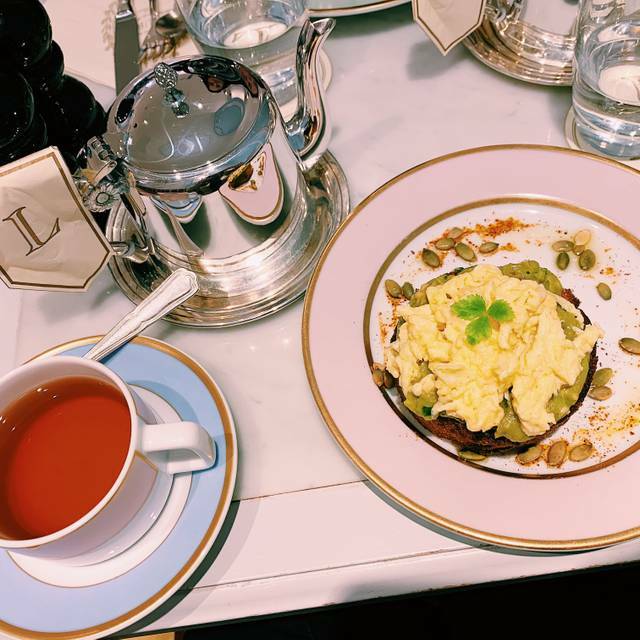 This new Ladurée consists not only of a lovely boutique, but also a tea salon and restaurant. This exclusive address will offer an exceptional character, with its own decorative ambiance, in the Ladurée style. The restaurant is decorated with custom-made furniture and unique pieces, collected from the finest Parisian antique shops. At present, we do not have menu information for this restaurant. Please see their website or wait to visit the restaurant to learn more. It was so cold that multiple tables had to emphatically complain. The air was turned off for a short bit but soon enough we were once again shivering. Our server was not very attentive. The main course was not great but the dessert was absolutely wonderful. We had 2pm reservations and waited for several minutes to sit at our table and then another 10 minutes for our server. The macaroons and pastries were great but the finger sandwiches were not edible. It was stale white bread and no flavor. The tasted like they had been sitting in the refrigerator for several days. For $39 per person I expected fresh sandwiches. We had Madeline’s at the end that tasted like frozen pancakes. I’ve had lunch at Laduree before and I expected a better tea time with my children especially given the price. It was also extremely warm in the restaurant and uncomfortable. Everyone was soo sweer and kind with smiles . Was greeted inside as well as leaving with a warm thank you. I love this place. Food was fantastic. 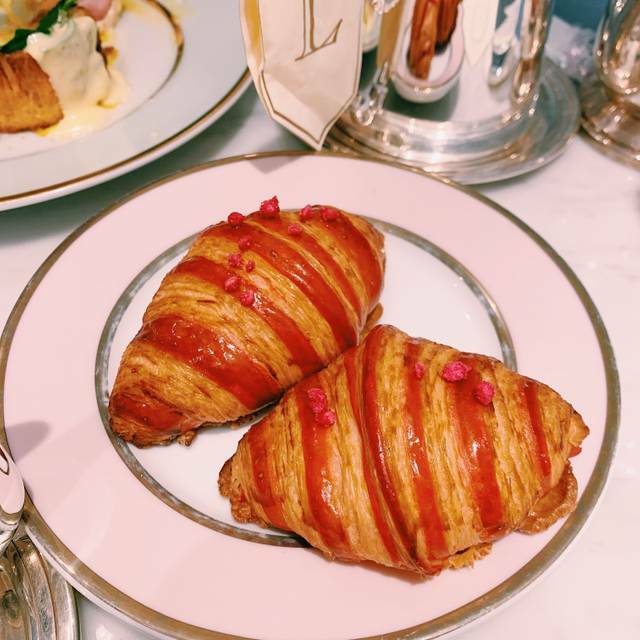 Service was sub-par, and the dilapidated decor should be embarrassing for Laduree. Quick service and excellent food! I would definitely come back for the Tea Service again! Service was slow. Very unorganized. Food was cold and not prepared well. 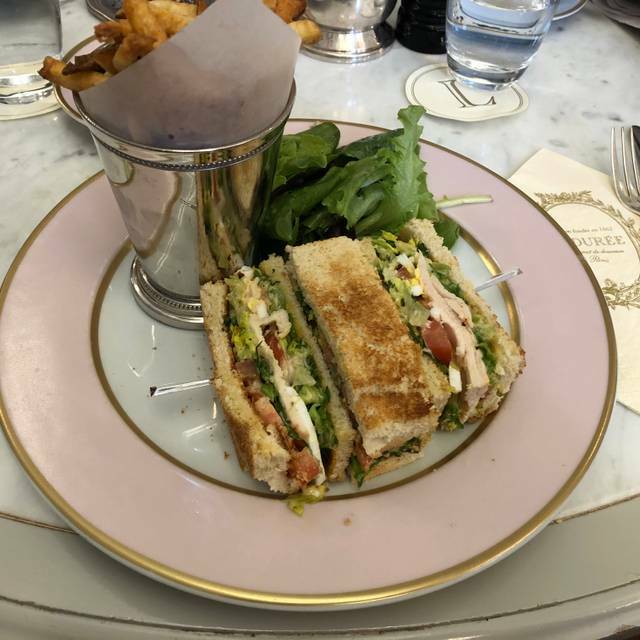 Always a delight to eat at Laduree. The staff was amazing. Overly attentive in a good way. I ordered the eggs Benedict with salmon: delicious! The interior is aesthetically breathtaking. Great place to have an afternoon tea! All of the food was incredible and the service was wonderful. Will definitely come back again! Lovely ambiance and quiet setting, making for easy conversation, but the food other than the pastries was mediocre and the service was very slow. Nonetheless, if you want a very leisurely paced lunch or snack in a delightful setting, it's worth checking out. We went for the tea service and let them know that we were both vegetarians, our waitress was very good about that and knew not to bring marshmallows and that we would need the cheese tea sandwiches. We got two sandwiches labeled “compte cheese” that ended up being chicken which I realized after taking a bite. Apparently all of the cheese sandwiches had been mislabeled chicken and vise versa. While the waitress was very apologetic the manager did not seem to care. They comped no portion of our tea service. Excellent French toast and croissants. It’s a really unique and comfortable place to dine; it’s more than just a cookie shop. Great meal! Went for brunch/ lunch. Terrific! Lunch was delicious in a lovely setting. A delightful spot for a more informal afternoon tea, which is hared to find in the Washington area. At the back of a bakery, but the area is up one step and is its own area, with a little low fence designating the special space. Only criticism is that the tea selection is ordinary, nothing special to try here if you are a true tea lover. We had to wait for an hour to get our food, other tables had the same problem..
We loved the space and the decor!! Lovely. Sadly, not enough wait staff. The drafts from the door opening were frigid. I would go again, and recommend the smoked salmon club sandwich, hold the egg. Yummy! It took a very long time to get our food. And the waitress kept getting our bills incorrect until we finally gave up and said we’d straighten it out ourselves later. slow inattentive service exemplified by prolonged lunch hour plus got eggs that were too well done, not runny as specified. Very disappointing. We had a great time! Food was amazing, along with the service and the macaroons at the end. Will definitely be returning! The service was AWFUL!!! Our reservation was for 6:30pm on March 13 and we waited 20 minutes before we were seated. When we finally got seated, the waiter made us wait for another 20 minutes again. First off it's a shame when the waiter is not properly trained to prounce the menu correctly. Once he took our order he came back to tell us that the kitchen was closed already and that everything that we wanted to order wasn't available. We were so disappointed!!! Why couldn't they have told us that beforehand!!! Second, I went to use the restroom and told one of the employee that I needed toilet tissue because there wasn't any available. He specifically told me that he doesn't know where it's at!!! Wow!!! That just blew my mind!!! I've been to other Laduree and we've been very happy. It's unfortunate that we had such a bad experience. Beautiful decor, beautiful macaroons and pastries - we loved visiting the first dc location of Laduree. The staff (management) was working hard to make sure everyone was well-attended to and had a good experience. Customer had purchased all of their croissants right when they opened on a Sat morning (we found out when my husband ordered) - they were extremely accommodating and polite in ordering. The small space is really loud - already very popular - wonderful ambiance. Clean, fresh, fun. The food was great, but the service was humiliating. If you want to actually have a good experience, go to Boulangerie Christophe nearby. The waiter didn't speak a full sentence to us, only grunted, throughout our entire breakfast. He forgot half our order. The manager tried to make it up by giving us some macaroons but really, she also seemed like she could care less. I didn't want to take all of the bad service reviews seriously, but they have really, truly terrible service. There are so many people they could hire to do a better job, so why aren't they? Unfortunately was not too impressed with the service, prices or the food. Lots of confusion regarding who our server was, had to ask multiple times for the check and portions were very small. Franch charm and French pastries on tap. A space full of French charm, delivered up to American senses in a variety of ways. Outstanding food, aesthetic decor, French accents...all carry you away from mundane Washington. Plan for your visit. Space is tight and the shop is attracting big crowds. Unfortunately they are clearly not ready to be open.